Welcome to the United States of America! The U.S.A. is the third largest country in the world and is also one of the most beautiful. It is full of lakes and rivers, mountains and canyons, beaches and deserts. It has many different trees and flowers, and all sorts of different crops grown for use as food. And, of course, America has birds and animals of all kinds. Last, but not least, the United States has about 300 million people from many different backgrounds and cultures. In this fun geography book for kids, you’ll meet five adventurous friends -- Wandering Willy, Nosy Normie, Meandering Mickey, Sightseeing Susie, and Exploring Ellie. Together they will help you learn about the land, cities, animals, and other wonderful things in each of the fifty states in the U.S.A. Along the way, you’ll also meet fifty other friends of theirs, each who will host one of the five friends and teach them (and you!) about his or her state. These fifty friends are very special! They are each named after the capital city of their state. Enjoy the trip! In addition to geography books for kids, find other works by Ellen Weisberg and Ken Yoffe, including fantasy books for kids and more. These authors are known for their creative stories and engaging characters, perfect for anyone in search of bullying books for children and books on other important issues. 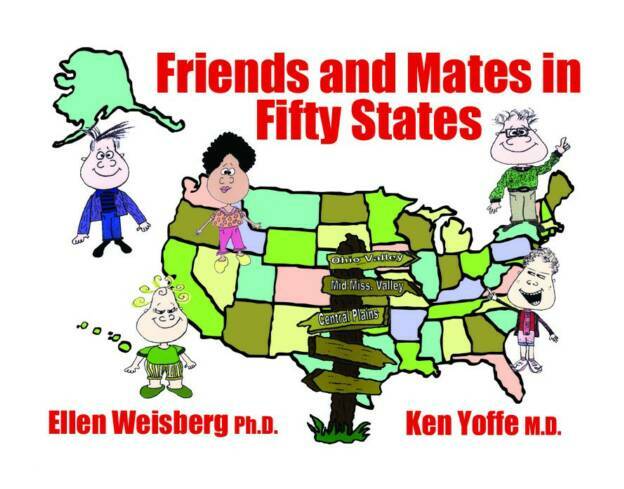 "Friends and Mates in Fifty States" Videos! Click Here to Download a Free "Friends and Mates" Poster!